This triangular lake of serene waters has a perimeter of about half a kilmetre. It is about 25km from Badrinath. 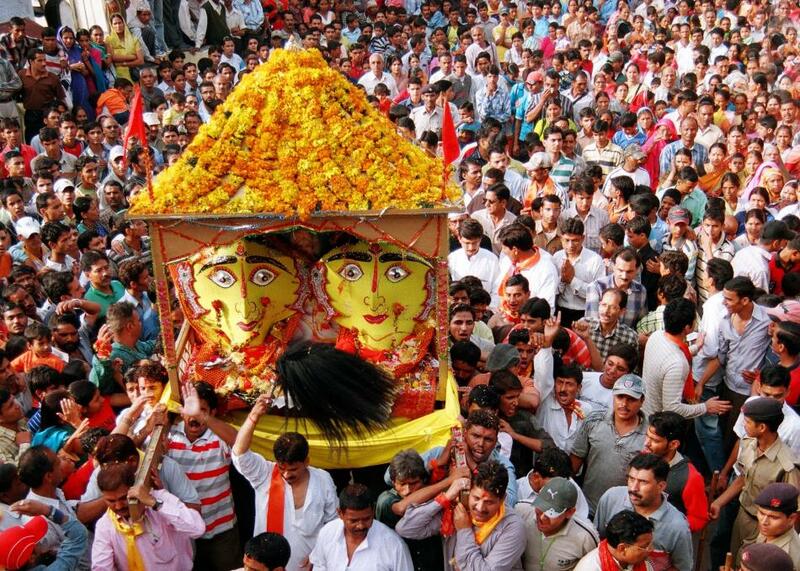 Brahma, Vishnu and Maheshwar, the Hindu trinity are believed to occupy one corner each, and which are named after them. The trek is hazardous, but the landscape is very dramatic. A guide is advisable. There is no place to rest in between, except caves. Cooked food, stove etc, have to be carried from Badrinath itself. Delhi———————————- Satopnath Lake————— 557 kms. Delhi———————————- Meerut ———————– 67 kms. Roorkee —————————— Haridwar———————- 31 kms. Joshimath—————————— Gobvid Dham—————– 19 kms. Govind Dham————————- Badrinath———————- 25 kms. Mana———————————- Satopnath Lake————— 16 kms. Rail :- Nearest Railhead is Rishikesh. Air :- Nearest Airport is Jolly Grant at Dehradun. Best time: July To September. The Nanda Devi North and Nanda Devi South two noteworthy glaciers of Uttaranchal Himalayas reguion are both approximately 19 km in lentrh. These glacers stem form lthe southern slope of Nanda Devi peak. 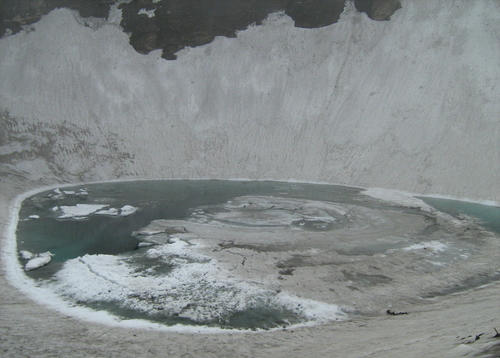 Therse well developed glacier can be accessed foem Lata and Joshimath which is the last roadhead. 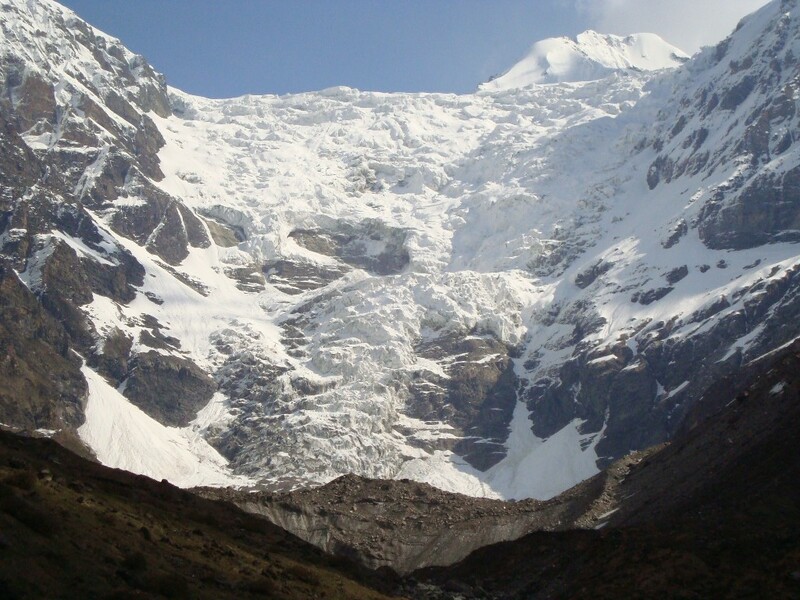 The trek to the glaciers onme of the most treacherous in Uttarachal measers through alpine neadows naooriw gorges steep Mounation slopes and sometimes through patches of snow. Approachable from : Joshimath on the way Malari Road through Lata. Location:On the way to Gangotri,at a distance of 73 Kms. from Uttarkashi,this sleepy hamlet offers immaculate beauty of the Himalayas,at an impressive height of 2,620 mtrs. above the sea level. By Road: Harsil is 73 kms. from Uttarkashi on the way to Gangotri. Weather: Pleasant summer, heavy rainfall, snowfall in winter. The Sahastra Tal and the Masar Tal lie to the west and east of the Khatling glacier, a lateral glacier at the source of river Bhilangana. The Valley of Bhilangana affords a panosramic view of snow-capped peaks and hanging glaciers such as Jogin group, Kirti Stambh and Meru, which are maginificent to say the least. The trek route passes through lush and verdant forests and green meadows, which during the monsoons come alive with flowers in full bloon. Trekkers have to also cross scores of small streams onf improvised log-bridges. Delhi———————————- Shastra Tal——————– 379 kms. Rishikesh —————————– Chamba———————– 62 kms. Chamba —————————— Tehri————————– 12 kms. Ghuttu ——————————– Shastra Tall——————– 10 kms. Milam at 3,450 meters is populary the largest glacier in the kumaon region and liew in the easternm region of Kumaon . It is sityuated on the south facing slope of the main Himalayas rage is 16 km long and originages form the slope of Kholi and Trushual [eaks it if s\fed by the Nanda Devi on the west and the panchuli and Kalababdar glaciers form the east and is the soure for the Milam river snd tirbyrary of lthe Pindar river. The Jounary involves a bout 10 days of rrekking between 4-7 houres each day . The best season is May –June and spetmber –October. Delhi———————————- Milam Glacier —————– 705 kms. Munsyari—————————— Milam Glacier—————– 58 kms. Rail :- Nearest Railhead Tanakpur. Air :- Pithoragarh has an Airstrip At Naini Sani. Munsyari to Lilam——————— 12 kms. Liam to Bog Udiyar——————- 13 kms. Bagudyar to Railkot——————- 12 kms. Martoli to Burfu———————– 09 kms. Mialm to Milam Village ————— 08 kms. Millam Vullage to Glacier————– 05 kms. Roopkund Lake, at around 5,000 meters, offers one of the most spectacular trekking routes with its stunning views of Trishul. It is also famous for the mystery surrounding it. This shallow lake still has the skeletal remains of some 300 people who perished swome 600 years ago in an unrecorded disaster. Trekkers have found human bones on the shore of the lake confirming this tragedy. Some belive them to be the remains of General Zorawar’s soldiers who perished here in a vain attempt to conquer Tibet while others maintain that they are the skeletons of zealous pilgrims undertaking the Raj jat, an important pilgrimage. 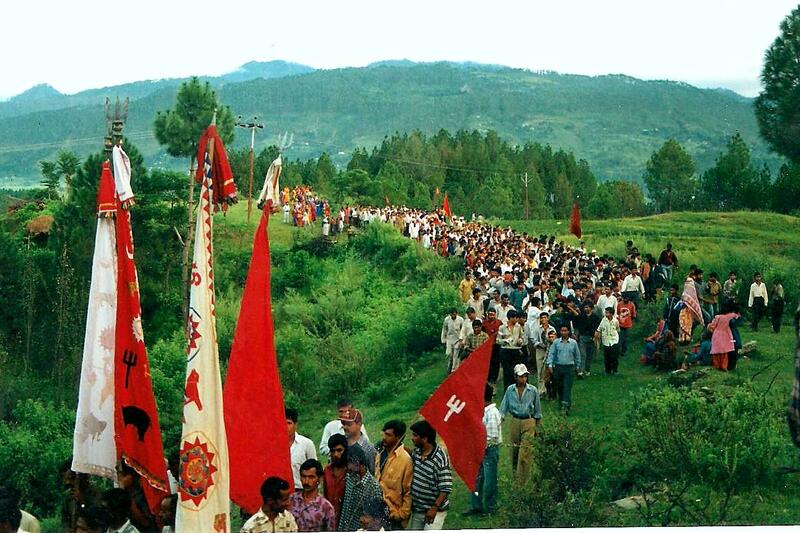 to pay homage to Nanda Devi. Moradabad————————— Rampur Doraha————— 07 kms. Rampur Doraha———————– Kashipur———————- 33 kms. Gwaldeam—————————– Lohahang Pass—————- 27 kms. Lohajang pass————————- Roopkund——————— 43 kms. This lateral glacier situated in Tehri District is the sourceof river Bhilanga> the glacier is surrounded by the snow peaks of the hogin group (6466)sphetic pristwar (6905m)Barkte kauter (6579) krti stambh (6902m) and Mery. The pristwar morainses on the side of the glaciers look like standing walls of gravel mud. 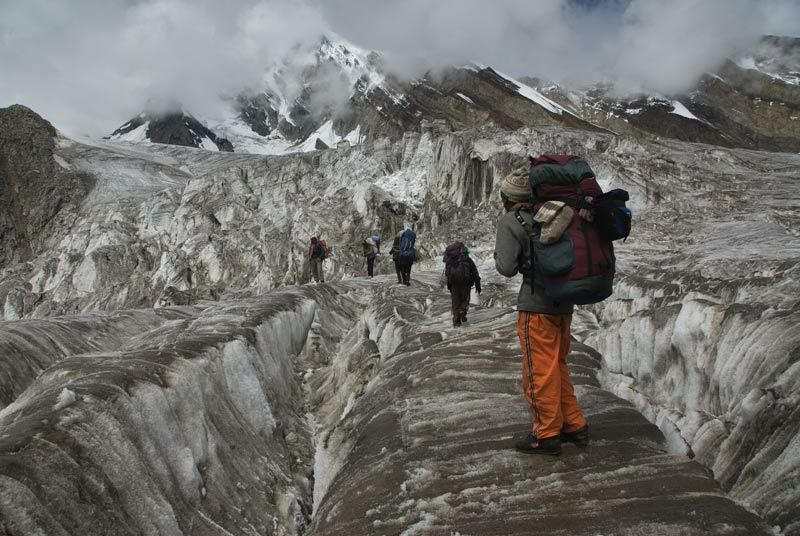 The entry to the Bhilabgana Valley provides excellent sports for camping . 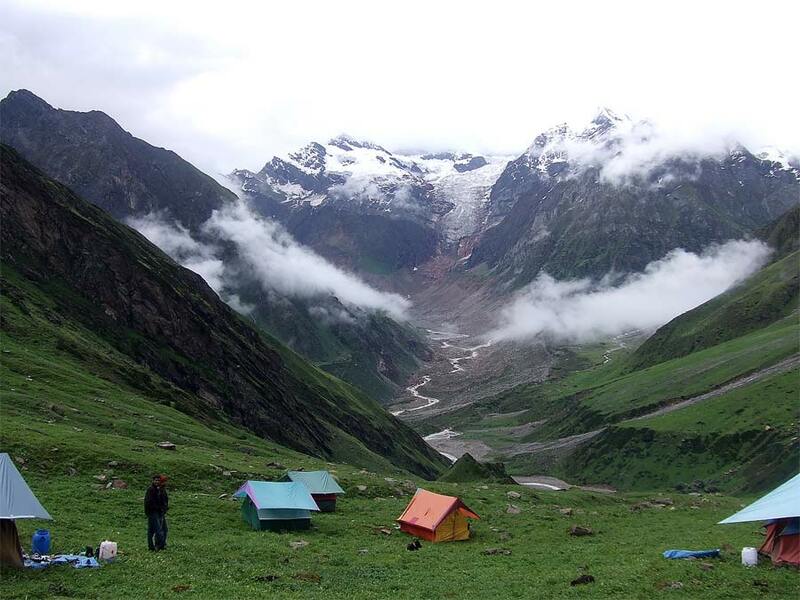 Tents and adequaters proviside need to be arranged inadvance from Rishikesh , Tehri or Dehradun. Delhi———————————- Khatling Glacher ————– 452 kms. Reeh to Gangi————————- 10 kms. Gangi to kalyani———————– 05 kms. Kalyani to Bhalbagi——————– 13 kms. Bhelbagi to Khatling——————- 07 kms. The scenic beauty and the tranquility prevailing in this region has an unbeatable charm. 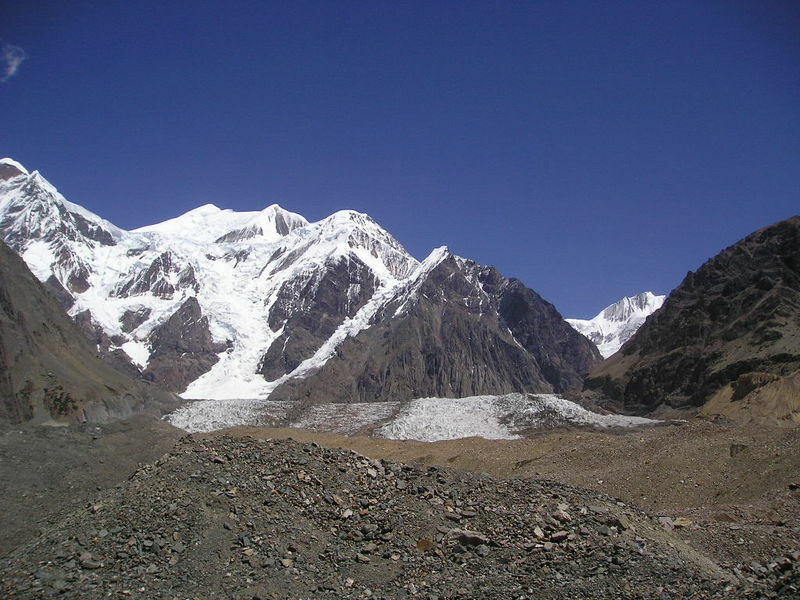 The kaphni glacier lies left of the pinder Valley below the famous peak of Nadakot. As cpompared to pinder the valley is much broader and the rhododendron that bloom ther are spectaculary beautiful. The main Himalayan summits visible from the glacier are Nandakot (6860m) and Nababhar (6236m). There are no rest houses beyond Dwali on the Kaphni track so one has the use tents. Byali Udiyar is an ideal spot for a hight stay there are grasslands to pitch a tent and caves for a convenient hight half. The best season is May – June and September – October. Bageshwar is well conncted by road to all major towns of the state. Taxis are available for local transport. Delhi———————————- Kafni Glacier—————— 489 kms. Bageshwar—————————- Song ————————– 36 kms. Dwali———————————- Kafni Glacier—————— 12 kms. Rail :- Kanthgodam is the nearest Railhead. Air :- Panthnagar is the nearest Airport. Song to Loharkhet——————— 03 kms. Loharkhet to Dhakuri—————— 11 kms. Dhakuri to Khati———————– 08 kms. Diwali to Kaphni Glacier—————– 12 kms.